Ann Arbor, Michigan – GMTA (German Machine Tools of America) represents various top-quality German metalworking machine builders, including Wera Profilator, K + G, Pittler, Praewema and WMZ, as well as Arnold lasers and Rosink parts washers. These machines are sold to the North American market exclusively by GMTA, primarily for gear and spline production, as well as other power transmission and various metalworking applications. The company’s target markets include automotive, off-highway, energy and other heavy equipment manufacturing. Machines are provided for gear honing, gear grinding, the patented Scudding® process for gearmaking, polygon milling, turning, gear tooth pointing and multi-task machining operations, as well as various laser operations or laser line integration and parts washing. This newsletter is provided to our friends in the media to keep you and your readers updated on News of Note at GMTA. -GMTA has formed an alliance with Star SU LLC in Hoffman Estates, Illinois to manufacture Scudding® tools for the North American market. Scudding® is the radical improvement on traditional power skiving technology for gear production, long proven in the market to be faster, more accurate and versatile in use. Often thought to be limited to internals only, Scudding is fast beginning to compete in certain applications with hobbing on external gears and splines, as well. 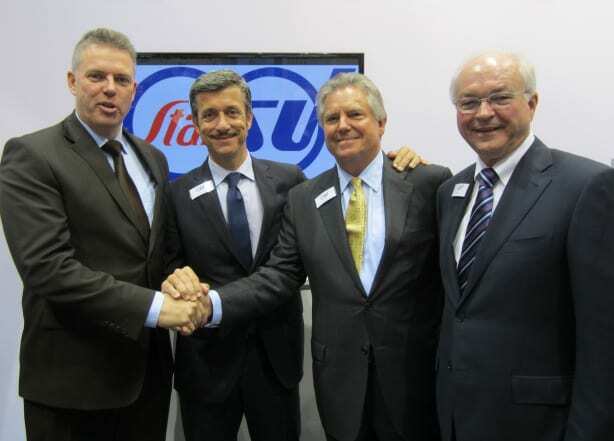 David Goodfellow of Star SU signed the agreement with GMTA president Walter Friedrich and VP Scott Knoy. -GMTA continues to expand its representation of K + G (Kristen + Gormann), a tooling manufacturer in Germany that supplies the industry with products for inside grooving, turning, profile milling, facemilling, geartooth milling, chamfering and back angling. K + G became the third line added in 2014 to the family of manufacturers currently represented by GMTA, joining Arnold lasers and Rosink parts washers. -GMTA will be exhibiting at Gear Expo and EMO, this year, the latter in conjunction with partner companies in Europe. -GMTA is supplying Magna Powertrain a variety of machine tools and systems for its Audi Flex program, both in Muncie, Indiana and Mexico. -Both Ford and General Motors plants have purchased additional Praewema honing machines for various transmission programs. -Jernberg Industries, Inc. in Bolingbrook, Illinois has added its fifth Profilator machine for ring gear production. -GMTA hosted a field trip for the students in the German Clubs at two local schools to the famous Kristkindlmarkt at Daley Plaza in downtown Chicago. The festival is a recreation of the classic German street markets set up for the Christmas season, featuring artisans and craftsmen selling their wares, plus music, food and drink for the season, including gluhwein! The students and their leaders had a good time. Froeliche Weihnachten…that’s Merry Christmas in German. Leading the event for GMTA was the corporate treasurer, Claudia Hambleton. A good time and much gemütlichkeit were had by all!